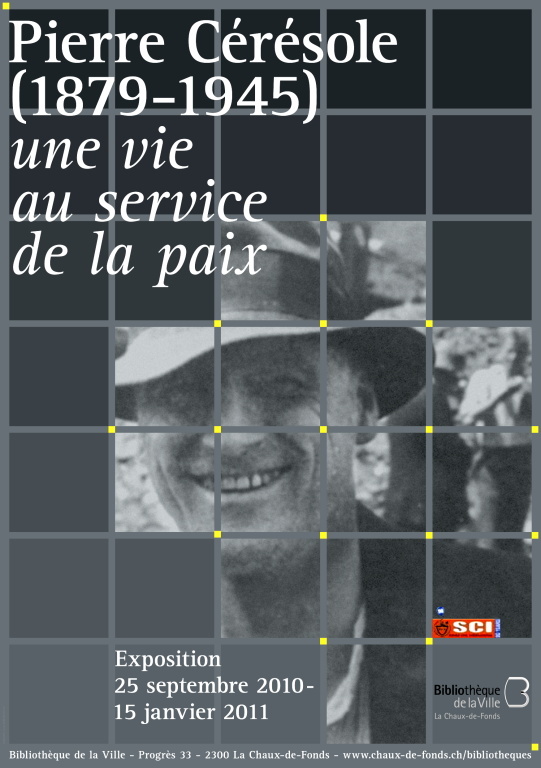 The La Chaux-de-Fonds Municipal Library has joined forces with Service Civil International to put together an exhibition devoted to Pierre Ceresole, a pacifist personality who is nowadays little-known to the public at large. From the World War I on Ceresole worked unstintingly to try to set up a civilian service for conscientious objectors, going as far as to launch a Federal campaign (in Switzerland) in 1922/1923. We had to wait more than seventy years before a public service was set up which replaced military duties for people who officially declare themselves to be conscientious objectors. As a matter of fact, up until 1996 the latter was tried by Military Tribunal and sentenced to prison. We can now appreciate how far we have come since then. As part of SCI’s 90th anniversary, in ten display panels, the exhibition takes us through the main phases in the life of the militant pacifist. It also refers to a number of historical landmarks in the development of conscientious objection and non-violence. The personal accounts of volunteers who have taken part in international voluntary workcamps highlight Ceresole’s heritage. It is traditional for the La Chaux-de-Fonds Municipal Library to house many collections belonging to associations or people connected with pacifism. For example, the collections belonging to the Esperanto pioneer Edmond Privat, the Centre for Non-Violent Action (CENAC), to that of Max-Henri Béguin and the Service Civil International. So it was quite natural for them to get involved in an exhibition project which is part of this commemoration. The texts have been translated into German and English for display purposes. This exhibition sheds new light on the action of a modern man committed to Peace. Sylvie Béguelin, Jacques-André Humair, Philipp Rodriguez. We would like to extend our sincere thanks to the all the people and institutions who have helped in putting together this exhibition, whether by lending documents, translating, proofreading or by taking part in the design of the texts. Pierre Ceresole (1887 – 1945): A lifetime serving Peace. Texts from: Sylvie Béguelin, Michel Mégard, Joel O’Neill, Philipp Rodriguez. With a foreword by Jacques-André Humair. Layout: Marilena Andrenacci. Published by La Chaux-de-Fonds: Bibliothèque de la Ville de La Chaux-de-Fonds, Service Civil International, 2010. 40 pages, with illustrations.